Everybody is sick. Let me paint you a picture. My sinuses are congested and my head feels like it’s full of concrete. My 2½-year-old is coughing like she’s been down in the coal mines all her life and has a perpetual runny nose. My 3-month-old is suffering from a wicked post-nasal drip resulting in choking and inhuman guttural sounds, followed in quick succession by alarming puking. Like that scene from Aliens when the android gets skewered by the Queen’s tail. Yeah. My wife describes her sore throat as something akin to swallowing razor blades. Our household has been transformed into a grotesque petri dish and some sort of bizarre microbial experiment is underway. We haven’t slept in two weeks. I need something to ease the suffering. I need a Penicillin. Sam Ross came up with this one around the time the first shipments of Compass Box whisky started landing on North American shores, back in 2005. The guys and gals at Milk & Honey were all in a tizzy with their new goodies and brainstormed on how best to use them. The M&H gang were well aware of the dearth of cocktails utilizing single malt whiskies, let alone those peat-bombs hailing from Islay. Sam Ross came up with the Penicillin – a cocktail that would appeal to the skeptics and break down the barrier between single malts and cocktails. That sounds promising. 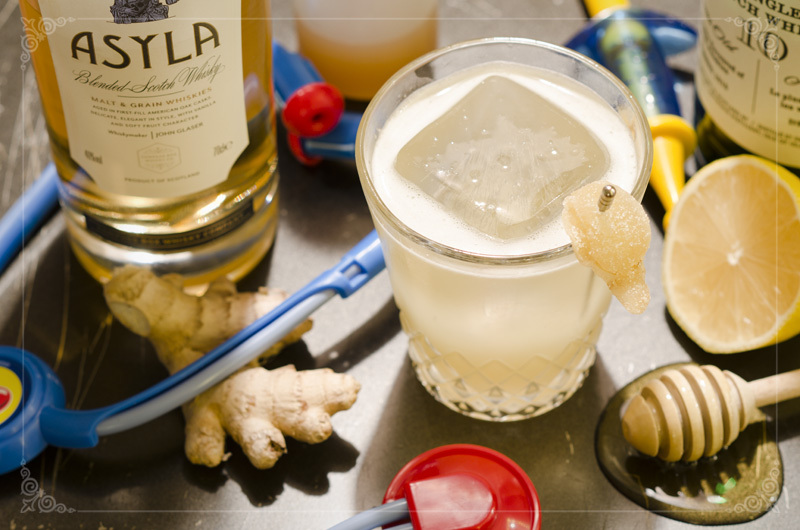 Broadly speaking, the drink consists of two types of Scotch, lemon, honey and ginger. That combination has the earmarks of an elixir with potent healing powers. Let’s prepare a dose. Add everything less the Islay single malt to a shaker. Aside: I’ve recently switched from a traditional Boston Shaker that uses a pint glass to one that employs a combination of weighted tins (28 oz./18 oz.) – I did it because the amazing Death & Co. cocktail book told me to. Anyway, fill the shaker with ice and shake like you were a centrifuge attempting to extract Penicillin from fermentation broth (… hard for those not familiar with biosynthesis – you know who you are). Double strain into a chilled Old Fashioned glass over a single large cube, carefully float the smoky Scotch and garnish with a piece of candied ginger. Oh, that’s nice. I’ve seen this drink made without the float, i.e. with the Islay single malt added to the shaker with the other ingredients – whatever floats your boat. Heh. You could also serve this one up in a chilled coupe. Syrups. Okay, honey syrup is easy: just add 1 part water to 3 parts honey. Shake to dissolve. The ginger syrup is a bit trickier. You need to somehow obtain ginger juice. What you need to do is find a sweaty redhead. Organic if possible. Ha, just kidding (by the way, don’t Google “sweaty redhead” at work). What I did was peel some ginger root, cut the root into manageable pieces and feed the pieces into ye olde G5-NG-853-S Champion Juicer. Voilà. If you don’t happen to have a juicer as powerful as one-third of a horse, don’t worry – there are other ways. The self-proclaimed “Cocktail Genius” lives up to his name by coming up with the rather clever method of wrapping the pieces of ginger in cheesecloth and using a citrus press to extract the juice by hand. I like it. Mix in sugar at a ginger juice-to-sugar ratio of 3:2. Now, you might be thinking, “why make two syrups when you can make it all at once, i.e. a ginger-honey syrup?” Sure, why the hell not? Add 3 parts honey, 3 parts ginger juice, 2 parts sugar and 1 part water to a pot over medium heat and stir to dissolve. Aaand boom goes the dynamite. Some common adverse drug reactions associated with Penicillin include diarrhea, hypersensitivity, nausea, rash, hives and neurotoxicity. Thankfully, I did not experience any of those symptoms when drinking the Penicillin Cocktail. Rather, I find an overall sense of well-being wash over me. This thing will cure what ails ya. This cocktail is surprisingly balanced. I guess I shouldn’t be too surprised given the drink’s reputation. Compass Box’s Asyla blended Scotch is nice and mellow – think sweet, delicate and smooth, with flavours of vanilla, cereals and a subtle almost apple-like fruit character. That is to say, nothing obnoxious with smoke or caramel or anything like that. Due to the float, the nose is pretty much what you’d expect – huge smoke, seaweedy, and medicinal.You’re tricked into thinking you’re drinking more peat than you are from the start, but the intense smoke quickly transitions into citrus, spicy ginger, and a nice, mellow sweetness. The smokiness of the scotch lingers at the end as well, along with the heat from the ginger syrup. Very nice indeed. I’d be tempted to try this with a tequila reposado and mezcal, and maybe use lime instead of lemon. Agave syrup instead of honey? Muddled jalapenos instead of ginger? Maybe call it the “Penicilina”? I’m sure I’m not the first to dream up a Mexican spin on this beauty. Alright, that’s it. I think I’ll do one more from Mr. Ross, which will conclude the series. Until then – Merry Christmas/Happy Hanukkah! PS I don’t recommend drinking pure ginger juice on it’s own. Too Spicy. That “Boom goes the dynamite” clip is amazing, I can’t believe I haven’t seen that before… Nice pic too, love it.